In 1821, Antoine Francois Jean Claudet married Julia Bourdelain at St. Mary Islington. In 1828, Antoine dissolves a partnership as glass warehouseman at Tavistock Street, Covent Garden, with Richard Hetley. A year later Claudet has moved to the Holborn area where Tallis was to find him. When, in October 1929, Claudet’s three children (Anne Mary, Justus Frederic and Henry) are all baptised at St. Andrew Holborn, the address for the Claudets is given as High Holborn, unfortunately without a number, so it is uncertain whether he already occupied number 89 where Tallis was to find him with another partner, George Houghton. Where the Claudets are at the time of the 1841 census is uncertain, but George Houghton and his family are definitely living above the shop at number 89, and they are still there in 1851. George is described as glass merchant in both censuses. Antoine Claudet and his family can be found at Park terrace, Islington in the 1851 census which shows the international background of the family. Antoine was born in France; his wife Julia in London; his mother-in-law, Ann Bourdelain, in Germany; his son (Justus) Frederick and his daughter (Anna) Maria both in France, but the younger son, Frank (Francis George), in London. Claudet was the author of a small brochure entitled ‘Du Stéréoscope et de ses applications à la Photographie’ (Paris, 1853; see the post on L.F. Colas) and of two Papers in the Philosophical Transactions of the Royal Society; one on the effect of the chlorides of bromine and iodine in the Daguerreotype process, and the second on the deposit of mercury on the silver plate. He also wrote many papers in various other magazines, all on various aspects of the photography process. An interesting article on Claudet’s photographic career and his successive studios, where his son Henry started his career as a photographer, can be found here (PDF at bottom of page). Unfortunately, the author relegates Houghton to a single mention in a footnote, which is a shame as he, and later his son, ran the High Holborn side of the business for many years. George Houghton seems to have been the man in the background, the one who quietly but successfully managed the shop at 89 High Holborn while Claudet invented and developed the photographic improvements. In 1852, George junior joined the business which was henceforth called Claudet, Houghton and Son. George junior obtained his freedom from the City of London by redemption in 1877, probably coinciding with his father’s retirement as the 1881 census lists George senior at Hampstead as a retired glass merchant and George junior as a glass merchant employing 16 men and 2 boys. Although George happens to be at an address at Hastings on the day the census is taken, it does not mean he has left London completely, as ten years later, he can be found at Willesden and is then listed as photographic dealer. He died in 1913 and from his probate record we learn that more members of the family were involved in photography as the three sons listed in the probate are all connected with the business: George Edwin is listed as a photographer and Edgar William and Charles Edward as photographic apparatus manufacturers. (5) More information on the further history of the Houghton business and (a very bad) picture of the shop can be found here. The shop itself was blitzed in 1940 and nothing now remains at Holborn to remind us of the photographic business. Portraits done by Claudet can be seen at the National Portrait Gallery (here). (1) Oxford Dictionary of Biography and Encyclopedia of Nineteenth-Century Photography. (2) The London Gazette, 8 April 1853. (3) The application form can be seen on the Royal Society website (here). (4) England & Wales, National Probate Calendar (Index of Wills and Administrations), 1868. Probate went to his widow Julia and son Frederic. The estate was valued at under £6,000. (5) England & Wales, National Probate Calendar (Index of Wills and Administrations), 1913. The estate was valued at over £17,800. The Architectural Library at Holborn – not a library at all, but a bookshop and publishing firm – was started by Isaac Taylor (-1807) who, in late 1797, handed over to his son Josiah. 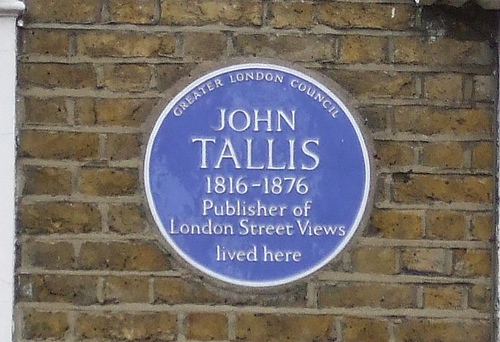 (1) The shop was then located at number 56 Holborn, or High Holborn as it was frequently referred to, but Tallis just calls it Holborn, so I will stick to that. I do not think they moved, but the numbering changed as it so often did in Victorian London. 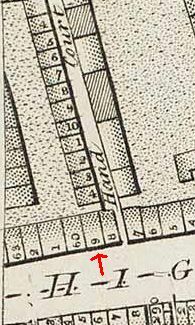 Isaac is shown one house from Hand Court in the 1795 Land Tax Records, but both 56 and 59 are one house from either side of Hand Court, so that does not help much. The entrance to Hand Court can still be seen under number 58 in Tallis’s Street View. In November 1822, a fire broke out at number 60, then in the occupation of a Mr. Walker, feather bed and mattress manufacturer, and it rapidly spread to the neighbouring properties on either side and at the back to Hand Court. 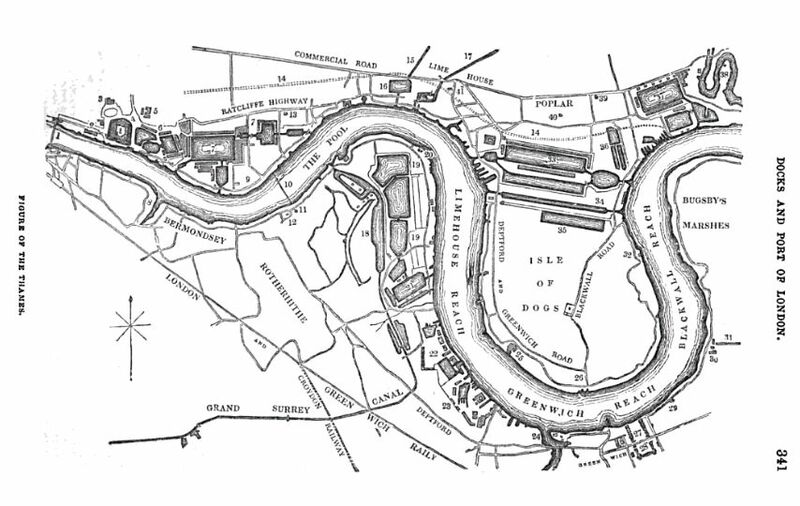 See Horwood’s map for the proximity of the Hand Court properties. The bakery on the corner of Holborn and Hand Court, number 58, occupied by Mr. Tate, had its upper floor damaged, but the firemen managed to stop the fire from doing more damage on that side. On the other side, they managed to stop it from getting to number 62, where an oilman was based, and had that gone up in flames, “the destruction that would have ensued is incalculable, as there was no time for the removal of the stock”. As it was, the damage was devastating enough. The roofs of two of the houses fell in and so did the front of Mr. Walker’s shop; “the progress of the fire was so rapid that Mr. Taylor’s architectural library was on fire and in blaze before any of the highly valuble scientific books and drawings which it contained could be got out”. (2) But Taylor managed to get his business going quite quickly again and in January 1823, he was already announcing new publications in the papers. Taylor died in 1834 and John Weale took over. Before that, he had been in partnership with Mary Priestley, the widow of George Priestley, at High Street, Bloomsbury. Weale had already steered that company towards architectural books; they had, for instance, published The architecture of Marcus Vitruvius Pollio in ten books in 1826, and the death of Taylor was a good opportunity for Weale to move on. The Oxford Dictionary of National Biography writes about him, “Weale’s evident ability attracted the attention of the pre-eminent architectural bookseller and publisher Isaac Taylor, who instructed his executors to assist Weale in purchasing his business at 59 High Holborn, London, on his death, which occurred in 1834”(3), but that is nonsense. Isaac Taylor died in 1807 and did not write anything about Weale in his will(4) and neither did Josiah Taylor who did die in 1834, but left his money to a vast number of friends and family members, but none to Weale. (5) Taylor directs his friends and executors, George Scrivens and James Webb Southgate, to sell the leasehold at 59 High Holborn, and all his other property, and to distribute the proceeds amongst his heirs according to his wishes. From the will we learn that nephew Martin Taylor was Josiah’s assistent, presumably in the bookshop, although that is not specified. Martin is to get £1500 and a gold watch. A later court case sees Martin and his three siblings taking proceedings against the executors, but I will spare you the wrangle that ensued over the legal costs. 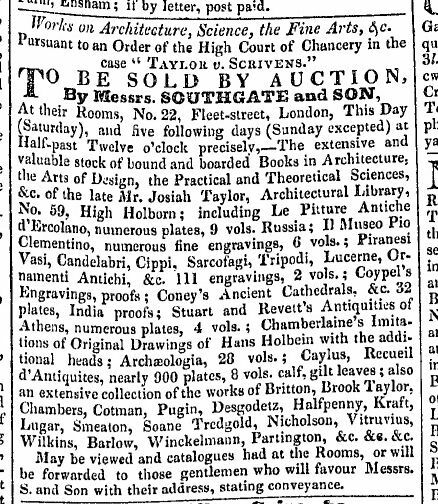 (6) What did happen, was that the stock of books in Taylor’s shop was sold off by auction. 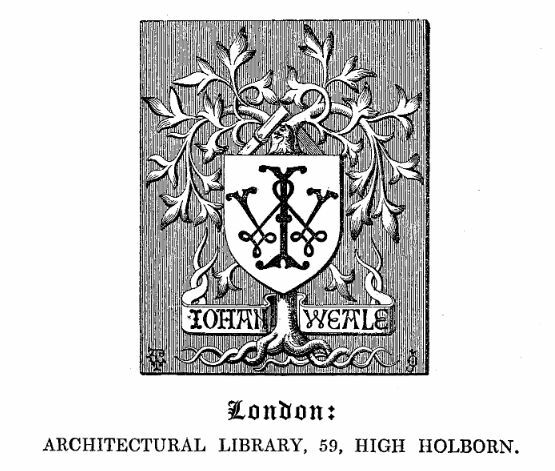 Weale not only sold architectural books, he also published them, many of them illustrated with intricate engravings, for instance the 15 plates of Atlas of the Engravings to Illustrate and Practically Explain the Construction of Roofs of Iron (1859; online here) with a list of “Mr. Weale’s Series of Rudimentary Works”. This was a series of works on technical subjects, brought out cheaply to reach a large audience. Wikipedia has an – incomplete – list. One remarkable advertisement in the newspapers caught my attention: Ferdinand de Lesseps tried to get financial support for his plan to build the Suez Canal and toured Great Britain to promote his idea. Weale published the reports of the De Lesseps’ meetings in various British cities (1857). (7) Weale also published work by Augustus Welby Pugin, the Gothic revival architect, for instance: The True Principles of Pointed or Christian Architecture (1841) and An Apology for the Revival of Christian Architecture in England (1853). Pugin’s published correspondence (The Collected Letters of A.W.N. Pugin, ed. M. Belcher) contains several letters to Weale, mainly about proof sheets and plate corrections. At the time of the 1841 census, John Weale, his wife Sarah, and their children could be found in Margate, presumably visiting friends or family. In the 1851 census, they are living above the shop at 59 Holborn. One of the children listed, James Watt Weale, was to take over the bookshop after his father’s death, but not very successfully; he went bankrupt in 1867. In 1861, the family lived at 19 Canterbury Villas, Maida Vale, and that is where John died on 18 December 1862. (8) In February 1863, an obituary was published in The Gentlemen’s Magazine in which it is said that Weale “made it his great object to suggest, create, and mature works which have been of acknowledged aid to professional men, and others. He long enjoyed the personal friendship of the first scientific men of the day, and may be truly said to be one of the benefactors of the reading public”. Hear, hear. (1) The London Gazette, 13 February 1798. (2) Jackson’s Oxford Journal, 30 November 1822. (3) Jonathan R. Topham, ‘Weale, John (1791–1862)’, Oxford Dictionary of National Biography, Oxford University Press, 2004; online edn, Jan 2008. (4) Suffolk Record Office, Bury St Edmunds Branch, HD 588/2/6. (5) National Archives, PROB 11/1828/218. (6) Reports of Cases Argued and Determined in the High Court of Chancery During the Time of Lord Chancellor Cottenham, volume 4 (1843). (7) Advertisement in The Era, 6 September 1857. The whole book can be read online here. (8) England & Wales, National Probate Calendar (Index of Wills and Administrations), 1863. The estate is valued at under £6,000 and probate is granted to widow Sarah.